LASP mechanical engineers design space science instruments to meet the requirements developed with the scientists; our in-house expertise in design, analysis, fabrication, assembly, and testing ensure robust instrument hardware. Mechanical engineers design instruments that are optimized to balance contractual requirements and in-house best practices. Reliable mechanism design is a critical element of instrument design. LASP mechanism designs are simple, use selective redundant components, and undergo extensive pre-flight testing. Common mechanisms that we design include mechanisms to steer or change out optics during flight; door mechanisms to protect instruments against contamination until they are opened in the space environment; and gimbal systems that move entire instrument suites as needed to point to specific data sources once in space. 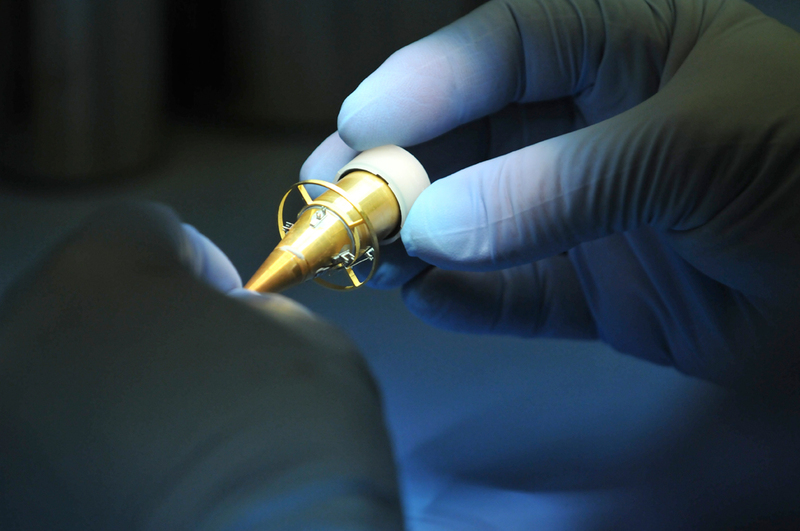 Detectors and electronics are at the heart of an optical instrument; LASP combines innovative and proven design approaches along with material and surface treatment selection to meet the unique requirements of each instrument. Detectors and electronics are often co-located to reduce data “noise.” Delicate optics are treated carefully and often isolated to prevent contamination. In addition to the mechanical “build” of an instrument, LASP mechanical engineers also work at the systems level. Thermal analysis ensures that the temperature of the instrument, once assembled, will work properly to dissipate heat generated during power production. Mechanical analysis ensures that the assembled instrument will be structurally sound and perform well after the vibrations of launch environment. LASP materials engineers provide technical support to mechanical engineering by advising on materials-related issues for instruments as they relate to the environmental and operational conditions under which the instrument will function. Materials engineers consider the type of material used and its potential effects on its surrounding environment; for example, out-gassing and particulates could corrupt the instrument during launch or deployment. Materials engineers also consider ways to shield detectors from radiation, temperature fluctuations, or other potentially harmful effects. Acquiring certified and stringently documented materials for use in our instrument development is an important capability at LASP. We support the Government Information and Data Exchange Program (GIDEP), which helps us ensure that any material or part that we order from an outside vendor is fully documented and any issues are communicated to us quickly. For example, if our materials engineers have specified a specific grade of aluminum, our procurement specialists can select an appropriate vendor, flow the requirements to that vendor, and ensure that appropriate documentation accompanies the aluminum before it goes into our instrument builds.